I went down to St Kilda to check out the kitesurfing and take some photos. I am still hobbling around as my leg heals. It was great to feel the wind and watch the action, given I am a few weeks away from getting back on the water. There were quite a few people having lessons and many more further out enjoying the good wind. The Kiddies Pond was busy too. I was really stoked to back on the water again after injuring my back after 5 weeks off. But then . . . another disaster . . . I was cycling to work on Monday 10 February 2014 down the Burwood Road hill from Burke Road travelling at about 40km/h in the bike lane. Towards the bottom of the hill, a car travelling in the opposite direction was approaching to turn right into Gillman St. As I approached I expected the car to give way to me while I passed, but it turned right in front of me blocking the road. I braked hard but was only able to slow to about 20km/h before impacting the car. The right hand side of my body (shoulder, hip and leg) hit the passenger door of the car hard side on. I bounced off and hit the road screaming in severe pain. The motorist stopped and was apologetic. She said she did not see me as the sun was in her eyes. The car has a broken windscreen and dented door from my impact. My right shoulder, right hip and right knee were extremely painful. An ambulance then took me to Box Hill hospital emergency department. I was examined by doctors and X-Rays were taken. I was informed late in the day that the top of my fibula was fractured. The very sore spots on my shoulder and hip luckily did not have bone fractures. I left the hospital with a leg brace with velcro closures and was told I could load bear on the leg as the tibia bears the weight. The fibula on the outside of the lower leg has attachment points for muscles and tendons - I was lucky that none of these or my knee was damaged badly. 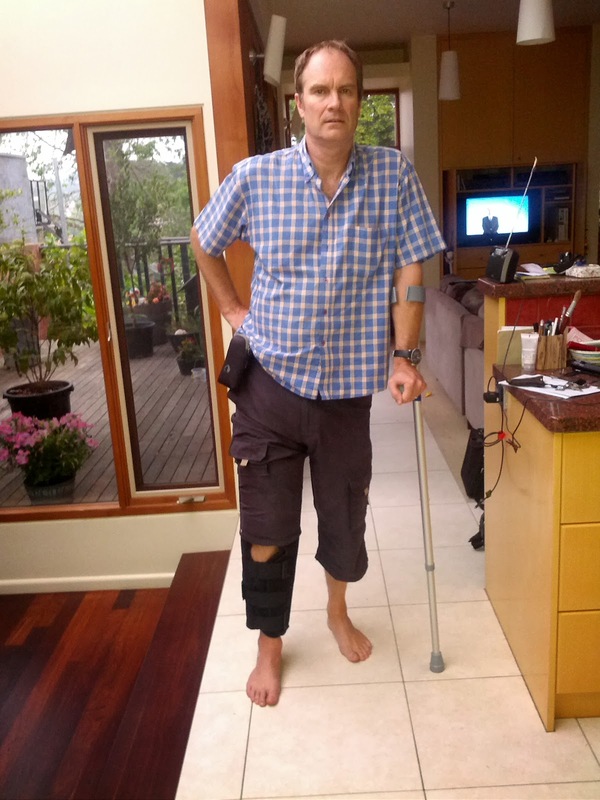 I went to work in Melbourne on Wednesday to Friday but it was not easy to get around with the leg splint and a crutch. I was still taking painkillers too. About one week later I was getting pain in my lower calf so I went to the Epworth hospital to get it checked. An ultrasound revealed a one major and several minor blood clots in my lower right leg. These are potentially life-threatening, so I was put on blood thinning medication to lower the risk of embolism. On Tuesday 17/2 I returned to Box Hill hospital for a checkup. The doctor said I should stop using the leg brace as my knee would seize up. 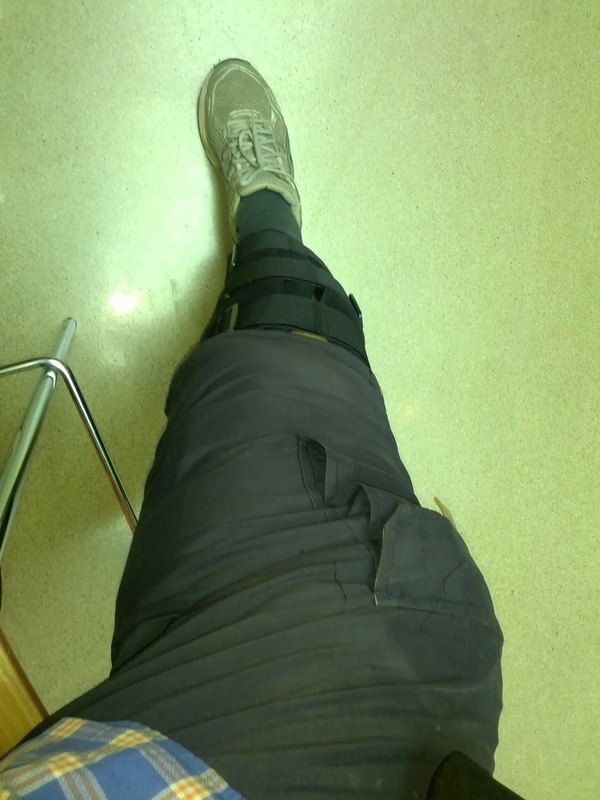 I took off the brace to find the knee was very stiff - I was unable to bend it. By Friday 21/2 I had regained some bend in my knee and was able to walk better, although slowly and with a considerable limp. I think it will be at least two more weeks before I can even consider kitesurfing again, which is VERY frustrating. 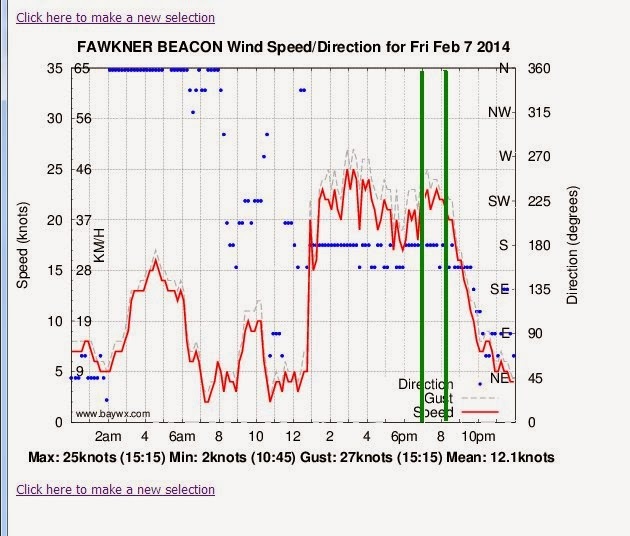 So the moral of this story is: avoid cycling on roads where this traffic whenever possible, and do more kitesurfing! Session 279. A big front ripped through after midday. We waited for the wind to calm down a bit and arrived at Hampton around 4pm. The wind was about 20 knots but their was stronger wind at South Channel and Point Henry to I took out my Lithium 9 and my Firewire strapless board with the intention of brushing up my strapless skills. I didn't make it out through the break however, losing my board in a wave. I walked over the first groyne to the new "windsports area" but there were more people on the beach and in the water there than on the north end of the new "swimmers only" zone. Its tricky getting going in the shore break when strapless. Broken waves pluck the board from your feet just before the water start. I dropped my kite and had to then untwist the lines. Eventually I got going and out to sea. There was some reasonable swell. My back held up well, although using the seat harness was not so good - I found it very restrictive compared to my waist harness. I got some nice runs out and in and rode a few good swells. Once again, it was just fantastic to be back on the water. There were quite a few kiters and some windsurfers enjoying the wind and bay surf, but there were some big holes in the wind. 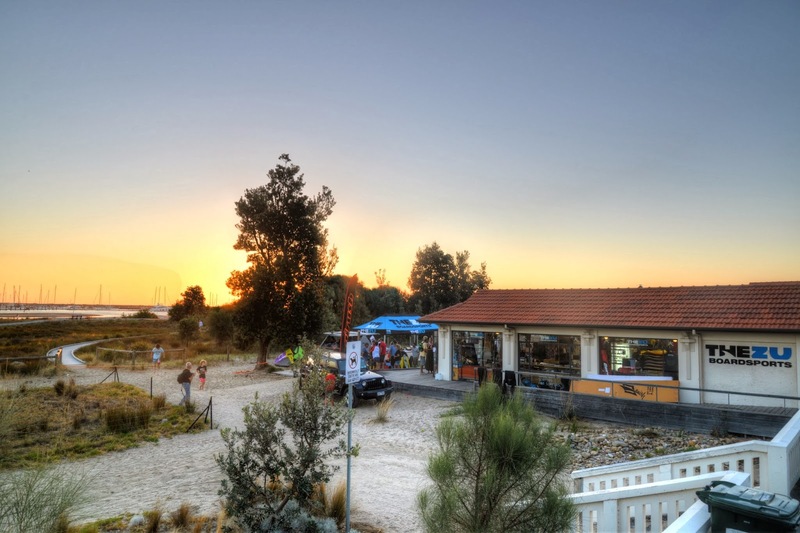 The newly announced "swimming and watersports" zones seem to be ignored by the majority of beach goers and kitesurfers. There were kiters on the main beach and swimmers in the windsports zone. Another kiter said that the Police had been down on the beach earlier. If you go to Hampton PLEASE keep well north of the Lifesaving club and marked swimming area (yellow buoys) and keep well out of the way of anyone in the water or on the beach. Back on the water kitesurfing at Hampton, woo hoo! Session 278. It was thirty three days after I fractured two transverse processes in my back. I cycled to work 4 days during the week with my back feeling good. The pain is gone but it aches when I stretch it. It felt good after a gentle Yoga session on Friday 31/1. 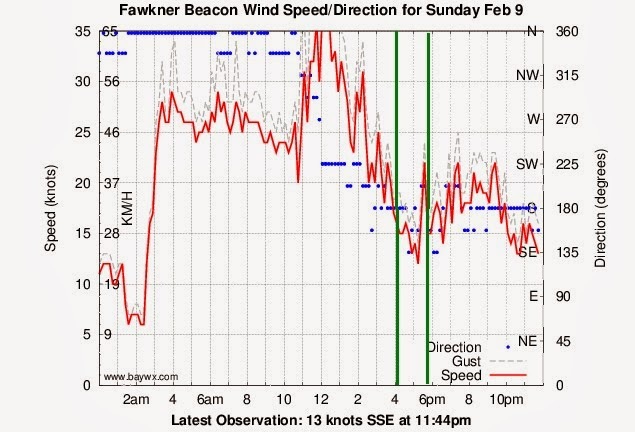 A nice sea breeze of around 20 knots was still blowing after I got home from work so Stuart and I headed down to Hampton for a late session. It was SO GOOD to get back on the water. I was well powered on my Lithium 9 and the S-Quad. Going out over the waves was a bit jarring so I took it easy, the run back in was cruisy. Riding the big swells in with some nice carved turns was great. My cabin fever was cured! The wind was steady and strong and the water was warm. We kited right up until dark with only us on the water.